How to import to Malaysia? What are the import procedures in Malaysia to move goods? Explain about import registration process, cargo movement to Malaysia from overseas countries, Import delivery process in Malaysia etc. 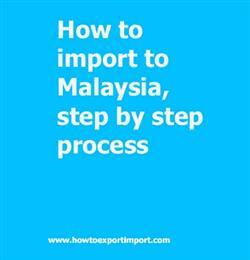 This post explains about step by step procedures that need to be finished with Malaysia government authority for importation to Malaysia. Those who wish to import or export goods, which require a license, traders first must register with the Companies Commission of Malaysia. Once registered, a company must then apply for an import license from the Ministry of International Trade and Industry (MITI). The Ministry of International Trade and Industry, MITI, is a ministry of the Government of Malaysia that is responsible for international trade, industry, investment, productivity, small and medium enterprise, development finance institution, halal industry, automotive, steel, strategic trade. Malaysia uses a privatized single digital window for all import and export regulations called Dagang Net. Normally, import of goods to Malaysia requires three categories of procedures wherever required. One-time registration procedures to act as an Importer in Malaysia, Specific import licence to import goods to Malaysia if applicable, and certain certification from concerned government agencies of Malaysia related to each import wherever applicable. The Royal Malaysian Customs Department, abbreviated RMC or JKDM, is the government agency responsible for regulating inflow and outflow of goods in the country, administrating the nation’s indirect tax policy, customs border enforcement and narcotic offences. Necessary documents need to be submitted with the RMC for import clearance process. This post explains about different phases in import process that every importer needs to go through in Malaysia. How to import to TAWAU? Formalities for import to TANJONG MANI. Procedures to import to SIBU. Need to import to JOHARBAHRU . Explain to import to Ipoh. Information to import to TAWAU. Step by step process to import to SIBU. Methods to import to Langkawi. Guidelines to import to KUCHING Please guide to import to Ipoh. Help to import to. Procedures required to import to Kota Bharu. Requirements to import to Kota Kinabalu. Clarifications to import to Kuching. How can I import to Kuala Lumpur. What should I do to import to TANJONG MANI. Rajesh Singh : On 12 August 2018 Hi, We want to start export of Agro Foods as like Peanuts Kernel and Sesame seeds to Malaysia from India.